Annie was both nervous and excited. Edward had asked her to accompany him on a walk on the beach on Sunday. Edward, of the handsome face and strong arms, had asked her! I’ll pack a picnic lunch, she thought, and I know, I’ll make some new napkins. She planned a masculine window-pane plaid to reflect the colours of the rocks and grasses on the beach. She planned and measured her warp. “I’ll make fat window panes intersected by thin mullion lines echoing the colour of the adjacent pane.” She planned. “The napkins will be sturdy and strong in classic plain weave.” She sleyed and threaded and wound her warp tightly. 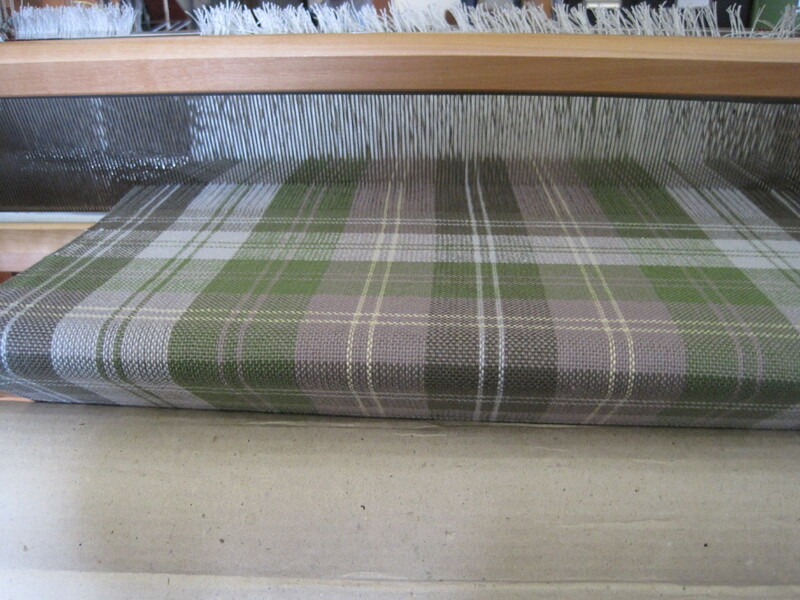 She wove a sample, carefully measuring to ensure the same number of weft picks as warp threads, following the warp order. 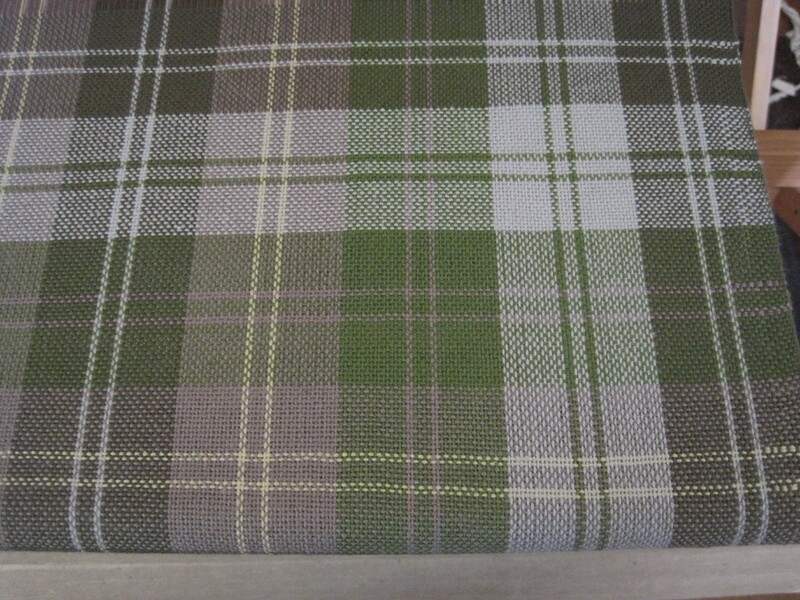 The sample was washed and pressed and hemmed. “Ah”, she thought, “the take-up for warp and weft is not the same, and the sample is longer in the length than width. She adjusted, reducing the number of picks in the fat panes by two to square the plaid. Now it was perfect and she finished the napkins just in time. On the day of the picnic, she packed the hamper with fresh bread and cheese, fried chicken, tomatoes from the garden, cake and lemonade. She added a blanket to sit on, and with great pride, packed the new napkins at the top of the basket. She put on her best summer dress, picked up the hamper and her sun parasol (to prevent freckles and sunburn of course), and was ready to go. Edward carried the hamper and held her hand as they strolled along the beach. Enjoying the warm summer breezes they walked and talked of little things. They looked for pebbles and shells along the beach and stopped to investigate the tide pools. “They are beautiful,” Edward agreed, looking at Annie, “and delicate. But they need to be returned to the ocean to survive.” Edward reached into the hamper and took out the napkins. Cradling the starfish in the cloth he carried them back to the water and gently released them. That is when Annie fell in love with Edward for his strength and compassion towards all living things. And Edward fell in love with beautiful Annie, the maker of such fine and sturdy cloth. And that is how the starfish became part of these napkins forever. 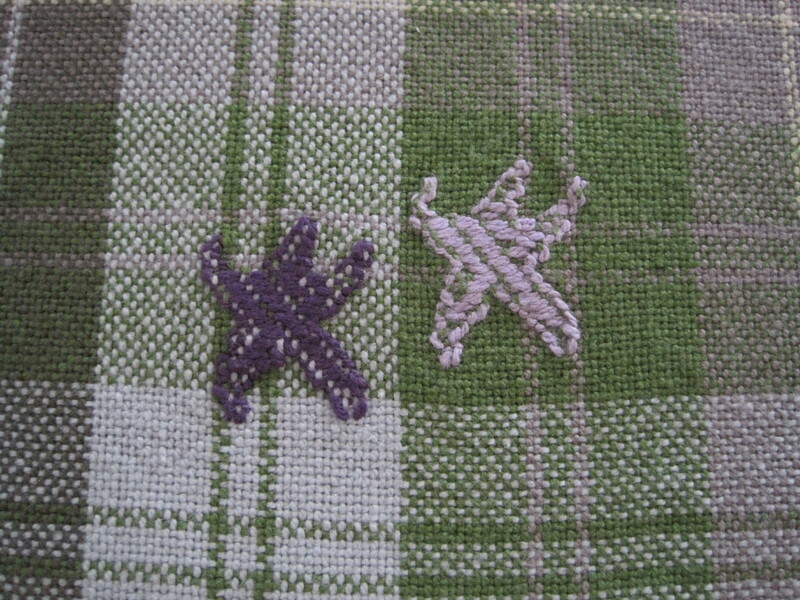 This entry was posted in Weaving and tagged cotton, Handweaving, handwoven, Loom, napkin exchange, sea stars, starfish, woven. Bookmark the permalink. You have a wonderful imagination! What a great approach to design – designing cloth to fit a scenario! Thank you. Oh, how fun! You could have a second career as a romance novelist! 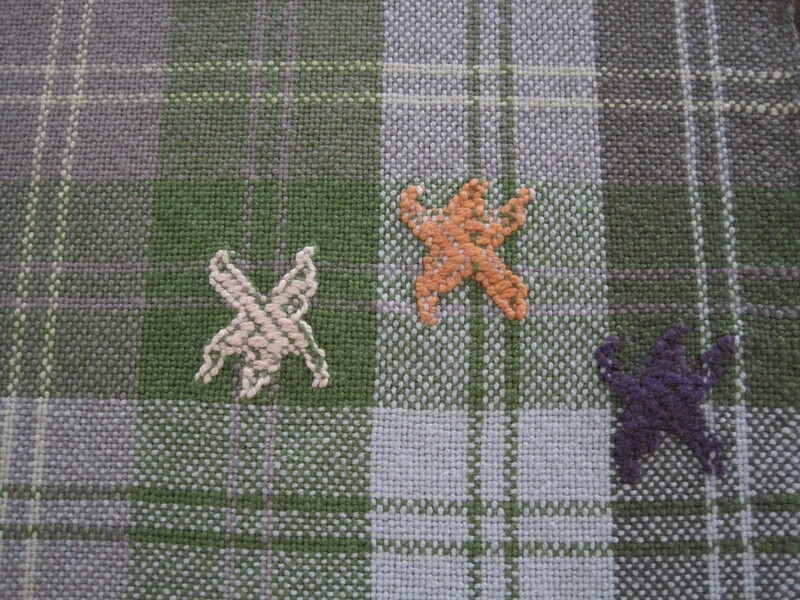 Yes, I know,it’s kind of cheesy, but that is where my mind went as I was weaving!